Retrieve the Cuirass of the Crusader from the Priory of the Nine. This quest only becomes available once you have downloaded the Knights of the Nine official plug-in. Find the Priory of the Nine and enter the Priory Basement. Survive the "test of worth" from the ghosts of the Knights of the Nine. Retrieve the Cuirass of the Crusader. Get clues on the locations of the other crusader artifacts. Collect the next four artifacts. "Step forward, adventurer, and face us each in honorable combat." The Priory of the Nine is located in the West Weald; a marker is added to your map when you read Sir Amiel's journal. Within the main building of the priory you will find a large symbol on the floor. Activate it; as long as Sir Amiel's Ring is in your inventory, the floor will drop down to reveal a door to the Priory Basement. Enter and make your way through to the door to the Priory Undercroft. 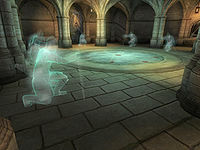 In the Priory Undercroft you will find the ghost of Sir Amiel. He informs you that he and the ghosts of the seven other present Knights of the Nine will test your worth in honorable combat before you will be allowed to take the Cuirass of the Crusader. One by one, you will combat each of the ghostly Knights, Sir Amiel lastly. The exit from the Undercroft is sealed once this challenge starts, so you should make sure you are well prepared for the challenge before entering the Undercroft. There is a brief pause between each knight's challenge, which provides a quick opportunity to heal and repair armor, but you are not provided with a chance to truly rest and recover. When you have defeated them all, you will be allowed to take the Cuirass of the Crusader. You are also given the rank Knight Commander in the Knights of the Nine faction. Sir Ralvas tells you about the Mace of Zenithar. He failed to complete the challenge of retrieving the Mace from the Chapel of Zenithar in Leyawiin, because he did not have complete faith. This starts the quest The Path of the Righteous. Sir Henrik tells you about the Shield of the Crusader. If you are faithful to the teachings of Julianos you may recover the Shield of the Crusader from Fort Bulwark, which was fortified to keep it secure. This starts the quest Wisdom of the Ages. This quest is not complete until you have collected all four of these artifacts. At that point, return to the Priory of the Nine, where a new arrival, Lathon, will approach you. After he has talked to you, this quest will be marked as completed (and the subsequent quest, The Faithful Squire, will have started). As you collect the artifacts, talk to the ghost knights for some updated information. Sir Amiel, Sir Juncan, and Sir Ralvas in particular have new dialogues. As you complete the side quests, people will show up at the priory to join the new Knights of the Nine. They will clean up the priory for you (in particular adding a lot of new beds upstairs). If you defeat any of the ghostly knights while they are demoralized, the other knights will react as if witnessing a murder. Do not use the Staff of Worms or cast any sort of resurrection/reanimation spell such as Risen Flesh on any of the Knights after defeating them. 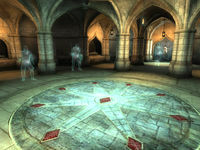 Once the reanimation effect wears off, either the Knight will die (if the spell is allowed to wear off) or it will become impossible to talk to the Knight (if the player kills them again) and therefore you cannot receive any subsequent quests from that Knight, which will break the Knights Of The Nine questline. 5 I've found the body of Sir Amiel, who appears to have perished centuries ago while questing for the Shrine of the Crusader. Perhaps I can find some clues on his body that will help my own quest for the Crusader's Relics turn out better than his. 30 The ghosts of the former Knights of the Nine have appeared and blocked my path to the Cuirass of the Crusader. They will not let me pass until I best each of them in single combat. 50 I've defeated the ghostly guardians of the Cuirass of the Crusader. I can now claim it for my own. 60 I've recovered the Cuirass of the Crusader. I should talk to the ghosts of the former Knights of the Nine to see if they can aid me in my quest for the remaining Crusader's Relics. 70 I've spoken with the ghosts of the Knights of the Nine and learned where several parts of the Armor of the Crusader are hidden. I should return when I have collected them all. It is possible to use the console to advance through the quest by entering setstage ND02 stage, where stage is the number of the stage you wish to complete. It is not possible to un-complete (i.e. go back) quest stages. See SetStage for more information. This page was last modified on 8 September 2018, at 05:49.